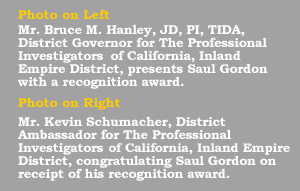 "To whom it may concern, I’ve had the fortune of meeting Mr. Gordon in 2008 as a member of the Orange County district of PICA, while serving as 2nd Vice President of the Professional Investigator of California Association (PICA). Saul became immediately involved in our organization and was soon the GO TO GUY for areas dealing with Forensic Accounting. Mr. Gordon shared his expertise with our members during several presentations, including one on Forensic Accounting to our Inland Empire District. In 2009 when I was elected as PICA’s President, Mr. Gordon momentarily assumed the District Director leadership over a flagging Orange County District and increased overall attendance in dramatic fashion. Mr. Gordon continues to aid the Orange County district to date, as its Ambassador. I can openly state that this district had never had more attendance that I’m aware of prior to Mr. Gordon assuming control. Mr. Gordon is extremely knowledgeable, selfless and dedicated. Mr. Gordon’s great leadership and organizational skills have been a major part of our association’s recent success. In short, “Saul has the intellect of a Professor and the humility of a student.” I would highly recommend Mr. Gordon to any public, private or governmental organization because of his many personal and professional attributes. Thank you Mr. Gordon for being a valued member of PICA and friend. PICA= Voices United "
“I have worked with Saul Gordon as both a retained expert, and as a neutral expert appointed by the court. In both capacities, I have found him to be thoroughly professional, knowledgeable and responsive to all inquiries and requests. After Saul completed one assignment as a court-appointed expert, my client was so impressed with Saul that he wanted to hire Saul to advise him regarding my client's medical practice, which was the subject of Saul's neutral, expert inquiry. Saul's integrity is unquestionable." "Saul performed outstanding work for Mazda North American Operations relating to the financial control processes in preparation for Japanese Sarbanes-Oxley (JSOX) for Senior Management and Internal Audit. As former President of the Orange County Chapter of the Association of Certified Fraud Examiners (OCACFE), based on Saul’s outstanding leadership qualities, business development abilities, integrity, ethics, and thorough knowledge of business operations, accounting, auditing and fraud examination skills, I recommended Saul to be President of the OCACFE in 2007. Saul has done an excellent job in raising the OCACFE into one of the best ACFE chapters in the world and I believe he will continue to provide great leadership for the OCACFE chapter and the ACFE in the years to come." "My name is E. S. and I am a Licensed Private Investigator in California, #*****. I recently performed an extensive examination of a government employee for malfeasance and embezzlement. I found there was a substantial amount of monetary loss to my client and retained the services of Saul Gordon, CPA, CFE, for the forensic accounting component of the examination. I had prior knowledge of Mr. Gordon's credentials and without any reservation I teamed up with Mr. Gordon. Within days, Mr. Gordon had his assignment completed and the results properly documented in a professional manner. Based upon Mr. Gordon's detailed performance and diligence in this matter, we brought this examination to a close and presented the final work product to the client and need I say they were extremely pleased with his work and our services." "To Whom It May Concern: I have known Mr. Saul Gordon from 2008. Our professional relationship began when we met at a PICA meeting. He is a professional in all undertakings, and in the management of his forensic accounting firm. He holds credentials of the highest standard. I can best describe him using the phrases commonly found in investigative reports describing one's suitability for positions of trust. He is a loyal, trustworthy American of good moral character, and I would personally trust him to ensure the protection of my finances in a situation of danger or jeopardy. He is an individual whose word I can take for granted on any topic. I would not hesitate in requesting his assistance or in recommending him to anyone who might need his professional assistance in forensic accounting or fraud examinations or in fraud prevention and deterrence. I am proud to know Saul and consider him a good friend, an asset to the forensic accounting community, and to the United States. I will be more than happy to speak on behalf of Mr. Saul Gordon, concerning his character and professionalism."